What does the future hold for our beloved wearables? Home > Wearables > What does the future hold for our beloved wearables? The majority of people today will be wearing or have previously worn a wearable device of some sort. It is safe to say wearables are a huge part of the technology industry nowadays and it is impressive to look at how much they have progressed, and how much more advanced they soon will be. 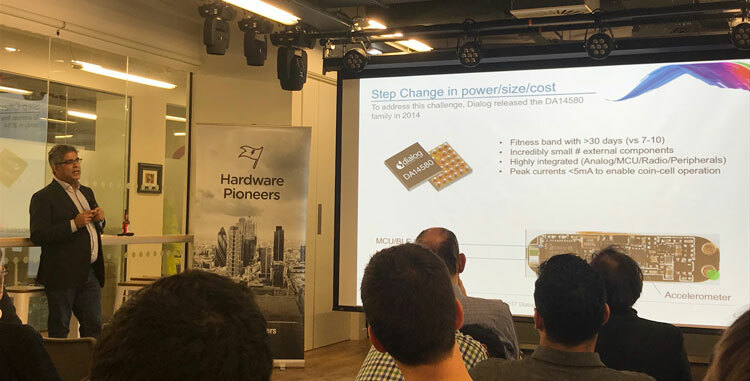 Electronic Specifier's Anna Flockett went along to this month’s Hardware Pioneers event which was all about developing wearable products in IoT and the opportunities they can bring. To start the evening we heard from Gordon Padkin of NXP, who focused on hardware and software solutions for wearable design. The important issue raised here were the considerations to make when selecting hardware and software components. NFC – is it a wireless technology that adds benefit to wearable technologies? Wireless power – can you cut the cord, do you need that cable there to hinder you? Long range, and low power – could this be an alternative option? GDPR – how can the hardware on MCUs help the wearable to meet the requirements for GDPR? MCUs and wireless integration – are just some paths you can chose from. 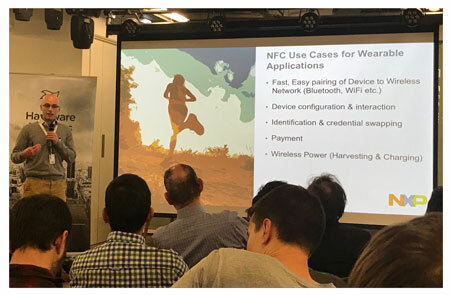 There are several uses of NFC for wearable applications, for example it makes the pairing of device to wireless networks such as Bluetooth or WiFi, fast and easy. It can also provide device configuration and interaction, as well as identification and credential swapping. It can make payment options easy - Apple pay and similar systems are far more common nowadays. Finally it can harvest and charge the wireless power in your device. How are we going to integrate wireless power for wearable devices? Scott Cooper from Silicon Labs had an answer to this question as his second talk focused on wireless power for wearables. And for all these different types of wearables what are the typical design requirements? He made sure to emphasise that size was important, as it is impractical to have a massive, heavy wearable that is meant to be unnoticeable, especially in terms of sport and medicine. Also an important factor relating back to powering a wearable is how do you make an antenna work in such a small but powerful product? When it comes to the antenna the amount of space it takes up, what type of antenna it is, and whether it is already integrated are all questions that need to be addressed, but also are issues that change depending on different product types. For example, having a PCB will take up a lot of space, but contrastingly is the lowest cost. This will result in a large end device which is sensitive to detuning. However, a chip antenna will be a higher cost, but brings a simplified design, and a smaller space is used. So at the end of the day it comes down to what is more important to you, cost or space? Finally Dipak Raval from Dialog Semiconductor explained to us that integration in the wearable space brings a number of benefits to the consumer in wearables and IoT. He first cast our minds back to 2010, where we were introduced to the first generation of wearables and the challenges which included a very basic design and simple LED displays. Also how funny is it to think that these first wearables could only be charged with a USB connector to a PC? They also included basic sensor fusion algorithms, which have come an incredible amount over the years. We then moved forward on in the time-line to 2011, when the second generation of wearables were introduced with advancements in the mobile phone support features. BLE was also a big feature, which then improved even further in 2012 when the first BLE transceiver was introduced. Skipping forward a little further to 2015 and 2016, we saw a major revolution with the ‘Dialog Approach’, which addressed all the challenges of security and size and integration, and there the DA1468x from Dialog Semiconductor was born. Now, when looking at 2018 and onwards what are the forward looking trends? The technology industry is changing every second, and wearables are a big factor in that. Who knows what the future of wearables will bring, but one thing that is certain is that Dialog Semiconductor believe SmartFusion to be a big part of the future. SmartFusion is Dialog’s proprietary 0-DoF sensor fusion SW library. It fuses 3D gyroscope, accelerometer and magnetometer information, and can also be used for 6 and 3-DoF systems. SmartFusion also includes ultra-low power – 0.2Mips on average, and calibration and fusion which is run on tiny low power.